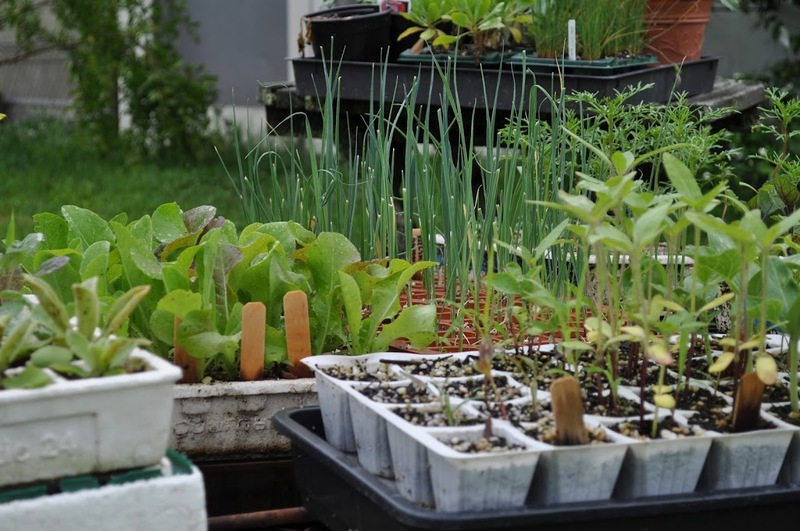 Here I am swimming in seedlings and small, potted plants sitting on shelves or the ground in the greenhouse, on my picnic table, and on the terrace. Each plant is waiting for the right time to be planted outdoors or to be moved to a bigger pot. So why would I add to the crowd by planting something as absurd as rice? Because rice tastes good and might be fun to grow. Interest in commercial and home rice cultivation has been on the rise here in the northeast, as attested to by last year’s Second Annual Northeast Rice Conference, held in — of all places! — Vermont. No paddies in the works here; I’m parting ways with most of my fellow growers in planning to grow rice under dryland conditions. Growing rice in flooded fields is a useful way to snuff out weeds — dryland weeds, at least — and, more importantly, in northern regions, to moderate temperatures. My planting is going to be very small, measured in square feet, so I can weed by hand, and my site is considerably warmer than anywhere in Vermont. My planting has to be small because I’m starting with very few seeds: the variety Hayayuki, generally recommended for northern conditions and kindly shared with me by Ben Falk (www.wholesystemsdesign.com). Ben has grown rice successfully in paddies he constructed at his homestead in central Vermont. So today I planted seeds in a seedling tray with inch square cells in each of which I planted one or two seeds. If everything goes as planned, I’ll be transplanting in a few weeks (rice does not tolerate any frost, doesn’t even like cold weather). Recommended spacing is 12 x 8” for groups of 2 to 3 plants. My garden soil is very rich so I’ll plant closer than recommended. Harvest, with a grass shear, should come in September, followed by threshing by smacking pillowcase-filled seed heads against the floor. As for dehulling the rice, that is, removing the hard coat around each kernel . . . I’ll cross that bridge when I get to it. Plans for a small-scale dehuller are available at http://www.savingourseeds.org/pdf/grain_dehuller.pdf. Moving on to more practical matters: gates. If good fences make good neighbors, good gates make good invitations to pass through fences. The gate to my south vegetable garden is not good. It was when I built it, the sturdy frame of natural locust wood swinging either open or closed with the mere touch of a finger. But locust wood is heavy, and that weight was the gate’s downfall, literally. For the past few years, the bottom scraped along the ground so that lifting the handle was necessary to open and close it. A five-foot span hinged at one end put too much stress on the wood. I realized recently that the extra trouble of opening the gate and the possibility of it breaking was was limiting trips into the garden. 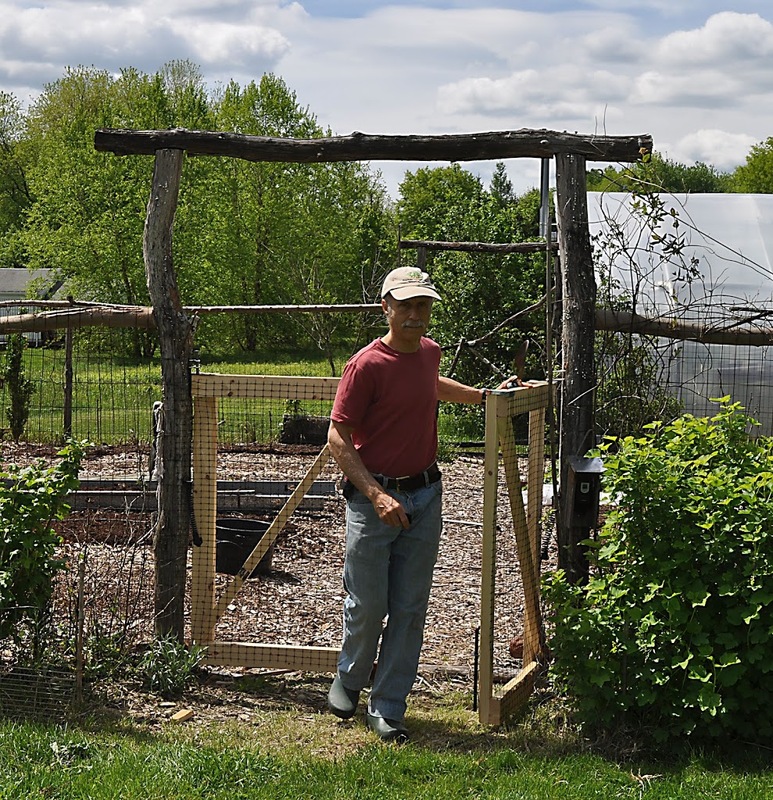 And there’s little worse for a vegetable garden than a disincentive — be it distance, too many weeds, or a gate that’s too hard to open — to enter it. That full five foot breadth was only necessary to let pass the occasional garden cart full of compost to spread over the beds. So why not, methinks, rebuild the gate with two half gates, one of which would be plenty wide for passing through for the almost daily planting, weeding, and/or harvesting. 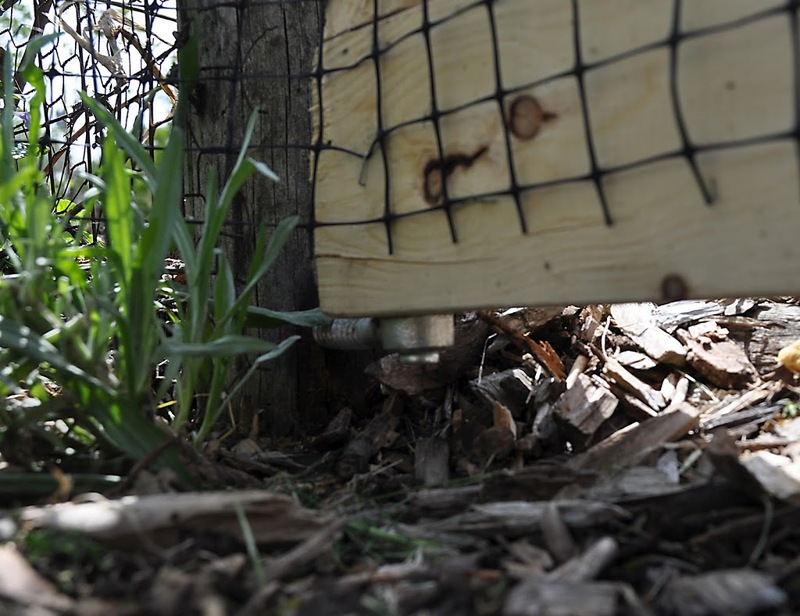 With less leverage, a half-width gate would experience little stress. The locust branches of the old gate made it charming but slow to build. I built the new gate — a temporary one — out of 2 by 4s. 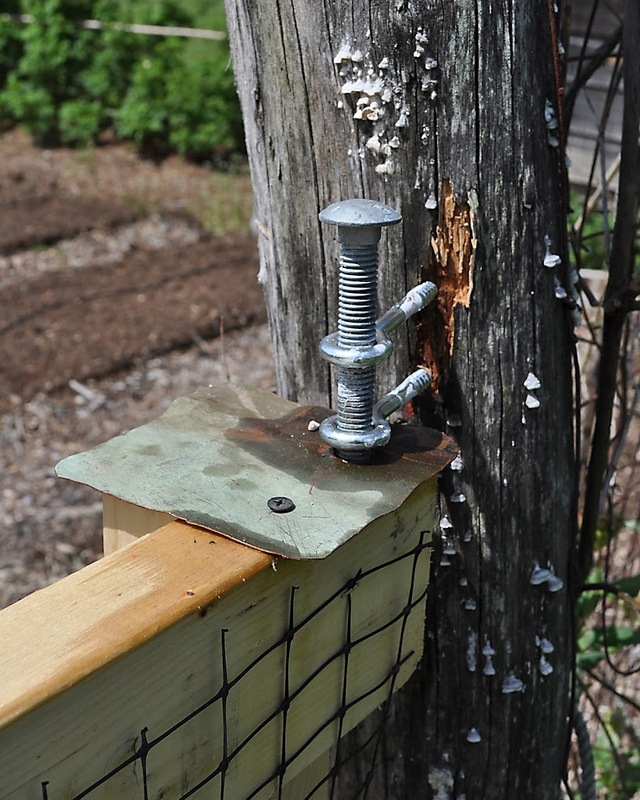 A pintle sticking up into a hole in the bottom and a bolt sliding down through two parallel eye bolts and then into a hole in the top together make a sturdy, effective, and adjustable hinge, so each gate swings easily and, with a spring closure, shuts automatically. Already, the garden beckons me. Beds have been layered with compost, weeds have been pulled, and today I’ll sow popcorn seeds. The only problem is that “temporary” building projects too often morph into things more permanent. Two compliments on the new gate have already started it down that road. This entry was posted in Uncategorized and tagged Ben Falk, garden gates, rice. Bookmark the permalink. Trackbacks are closed, but you can post a comment. Nice gates. Ha, now you have three compliments. Though I must admit, the locust gates were charming, from the pictures. I have a difficult-to-open gate that has been on my to-fix list for a year, but I’ve been sidetracked planting things instead. Growing rice sounds interesting, though I don’t have any space to devote to grain experimentation. Instead, I’m testing 5 new-to-me varieties of tomatoes in my front yard. I’m curious how many neighbors will pick the tomatoes, too. I hope the kids will help themselves to the Sweet Millions. Luckily, I have 8 more plants in the (fenced) backyard. The weather (near Madison, WI) was 89 degrees F today. I am declaring my yard done with frosts for the year and putting away my blankets. Well, I do have two more quick-to build, easier-opening gates to build before I rebuild them out of locust. One is at the other end of the garden in the photo and the other one to enter my blueberry cage/salon/gazebo. Amazing weather in Madison. When I gardened there, decades ago on Troy Drive, the last spring frost was always closer to Memorial Day, the first fall frost was around September 21st, and winter lows stayed around menus 30°F for a week each winter. Much nicer weather there now. Yes, it’s very different than when I was a kid. I have always lived in WI. Our last frost was the end of April, and our predicted first frost is now Oct. 10th. I don’t think we hardly got below zero this winter, but it was a very unusual winter. A few years ago we had record amounts of snow, over 100 inches. I’m on the south-west side of Madison, in Verona, though I make the trip to the north side for the Mallards games. I envy the blueberry cage, and am scheming to build one around a blueberry hedge some day. I’d have to take out a row of arborvitae first, to plant a blueberry hedge. We will see if my husband goes along with the idea in a few years. He has put up with a lot this spring, since I’ve constructed cement block raised beds for veggies, and turned the front yard grass into a fruit trees and bushes edible landscape. And tomatoes this year, since everything is so small. “Please just make it easy to mow around, that’s all I ask.” he says. “And find a way to contain your wood chip mulch, it stops the reel mower cold!” He is not a gardener, but no one is perfect. I highly recommend the blueberry cage if you want to eat a lot of really ripe berries. Speaking of blueberries, do you have an opinion on the use of sulfuric acid (specifically, that sold as battery acid) to lower the pH of blueberry irrigation water? I’m in an argument with someone. Sulfuric acid would do the job but I would strongly advise against using it. The stuff is highly corrosive to you and many materials, and would have to be diluted appropriately. Much wiser would be to use elemental sulfur, which does eventually become sulfuric acid in the soil, but very dilute. The ideal pH range for blueberry is 4 to 5. Add 3⁄4 pound of sulfur per 100 square feet for each pH unit the soil is above 4.5. Use three times this amount of sulfur for heavier soils. Pelletized sulfur, which resembles small, yellow lentils, is easier to spread and cheaper than sulfur powder. Good to know you agree. I think it’s rediculous for a home gardener to be using sulfuric acid when there are much safer options available. Thanks for your input. 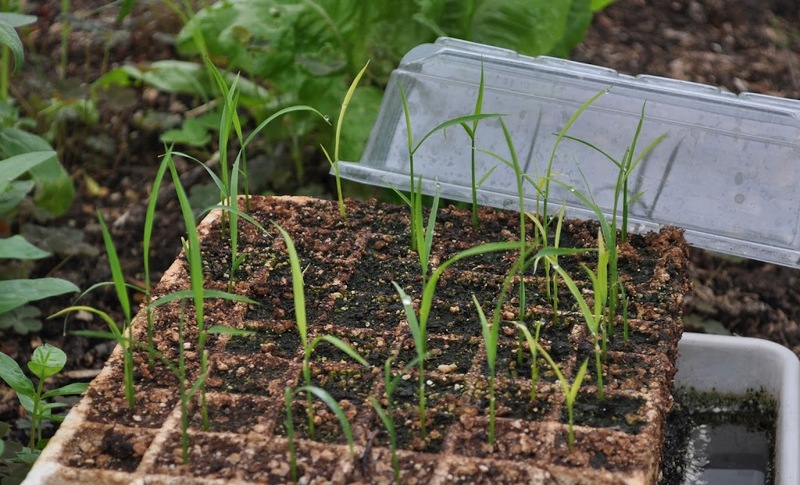 Did you soak your rice seeds to break dormancy before seeding in trays? Thank you.